I am always on the lookout for ways to encourage my children to dapple in the arts and express themselves creatively. A good friend told me recently about Brazee Street Studios in Oakley, and I immediately signed the kids up for a class. Brazee Street Studios has artist studios, a retail shop with supplies for glass art, an art gallery, and the School of Glass (SOG). The School of Glass offers countless classes, and even birthday parties! I decided to take the kids to the July Family Open House, where we made Family Portraits. This was a tough decision to make. I spent quite a while poring over their long list of class offerings, which included everything from robots to bowls to fish. The School of Glass has programs for children, and programs for adults as well. 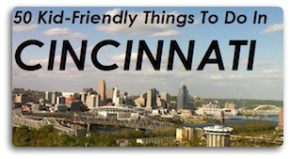 I loved taking my kids, but while I was there, I was thinking that it would be a great place for a date night, or for a mama’s night out with my friends. It would be something different & unique instead of dropping huge amounts of money at the movie theater. Each class is priced differently, we paid $10 per portrait (the kids each made their own, and I made Henry). The materials are all provided for you, and they have staff members on hand to help you out. The gentleman who assisted us was wonderful, he was so sweet and patient with the kids, while helping us cut glass and explaining the process. We had a lovely morning together at the studio, and before we left the kids were already making plans to come back. 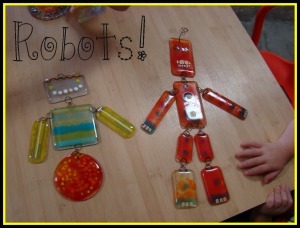 Max really wants to make a robot, and Ella wants to make a flower for their Glass Garden Installation. The first thing we did was to get safety glasses, and then listened to all of the instructions & ideas. Next we picked out our materials to use for the portraits. Then we used all of the pre-cut pieces of glass to create our portraits. After placing all of the pieces on a piece of clear glass exactly where we wanted them, glue is poured on top so the pieces won’t wiggle in transit. The project was easy enough for the kids to do on their own with just a bit of help from the adults with cutting glass. I loved watching them put the pieces together (great fine motor activity! ), and get creative with the clothes they picked out or how they made their hair. They were so engrossed in the project! The finished projects will be fired in the kiln for 18 hours, and then available to pick up in a few days. Max loved asking all kinds of questions about the kilns. The entire morning was a great learning experience on so many levels! Not only did the kids learn about a new art medium using glass to make mosaics, but they also got to practice self-control. We were in a place filled with glass, so the kids had to be careful when picking up the pieces since they are sharp. They also learned about firing glass, kilns, heating glass to bend it, different kinds of glass, cutting glass, and working carefully to create a masterpiece. After we finished we walked through the gallery One One to see the current show entitled hue yellow. It was very cool…so many creative and fun pieces! And if you are in the market, the pieces displayed in this show are for sale. That cool beehive caught my eye was my favorite. 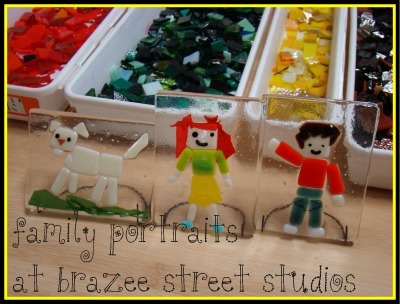 If you are looking for something new and creative to do with your family Brazee Street Studios might be just the ticket. They are located at 4426 Brazee Street in Oakley. 513-321-0206. And you can find them on Facebook to keep up with all of their goings-ons. Wander on over to www.thelittlethingsjournal.blogspot.com to see what Katie and her little things are up to this week! We love Brazee street! My 5 & 7 year old LOVE making projects and the results are always amazing. The projects also make wonderful presents.